Committed Stitcher: "I Will Never Have Cow Fur In My House"
Andreas claimed he would never have cow fur in his house. This started breaking down in Uruguay with a purse. Now I have three or four cow fur purses, a rope of cow fur stars, and cow fur scraps to play with. A couple of weeks ago, Andreas said," We're here. We might as well buy that cow fur chair you've been eying forever." 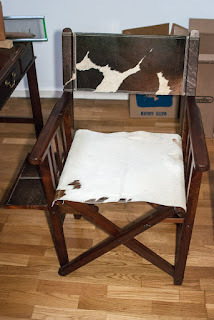 So, this folding chair from Kinda Home is now in my house!